Personal Menus is an optional feature available in Memberium that enables you to automatically change your theme’s menus on the fly depending on whether the viewer is logged in, and if they are logged in, which membership level they are. Memberium’s Personal Menus works by scanning the menu locations that are created by your theme and creating additional “virtual” versions of those menu locations. A virtual menu location is created for each of your membership levels, and for logged in users. The original menu location created by the menu is used by default and for logged out visitors. Use this function to easily synchronize and update your Infusionsoft app information with your with WordPress site. This setting under Advanced Options allows you to control how shortcodes are processed for OptimizePress 2.0’s (OP2) drag and drop design pages. You can choose between individual element processing, or more flexible full page processing. In order to optimize API usage, Memberium lets you control which data you synchronize during login. The Synchronize Tag Details option lets you enable or disable synchronizing the specifics of the contacts tag information during login. Synchronizing this data is useful if you want to make decisions based on not only whether or not a tag is assigned to a contact, but when the tag was assigned. 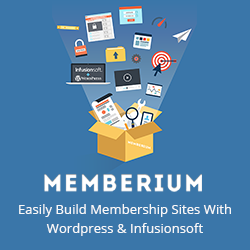 In order to optimize API usage, Memberium lets you control which data you synchronize during login based on your needs. The Synchronize Ecommerce Records option lets you enable or disable looking up and synchronizing the contact’s ECommerce information during login. This includes order and subscription history, credit card data and invoice data. Your users can update their billing info using our shortcodes. This is a switch that will be used for other future capabilities for which we have not yet published a roadmap. The Synchronize Affiliate Records option lets you enable or disable looking up and synchronizing the contact’s affiliate information during login. Synchronizing this data is only useful if your users are Referral Partners and you need to display their information on the site.